They are my coolest toys. I would sleep with them if I didn’t have a pretty lady, so instead I dream about them. Like Mitchell dreaming about Pepe the Spanish-speaking shark in Airborne (see clip far below). 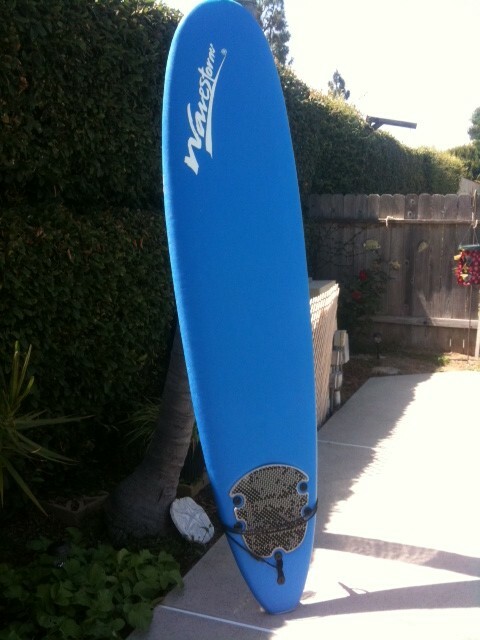 This is my current board, a 7’6 white and blue learner board. It’s not custom made or even brand name. As near as I can tell it was made in a factory with about 1,000 others. We call her Toffler after a friend on Twitter (World Future Society) suggested the name. It refers to Alvin Toffler the American writer known for his work on the digital revolution. This is Amy’s current board and it’s a boat. So called the Barnstormer because in the surfing world ‘barney’ refers to a very inexperienced surfer and the board has ‘Wavestorm’ written across it. It’s 8 feet long and you really can’t do anything with it except float. Which is perfect for the beginner who just wants to feel safe. It gives you a chance to learn the basics like paddling, sitting on the board, learning how waves break, and catching the crumblers (small waves). 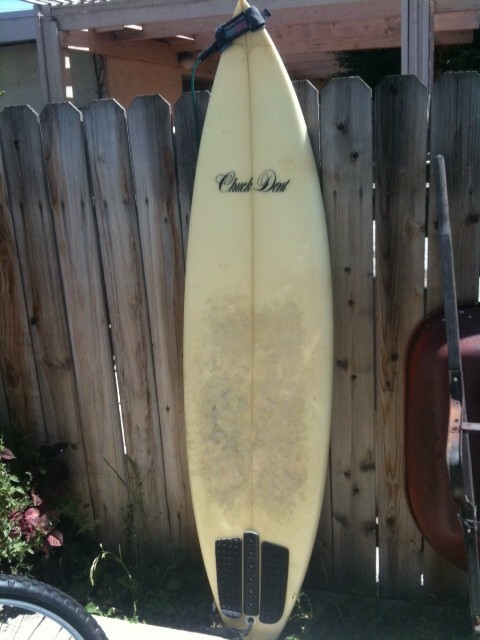 My very first surfboard, called Chuck, although Dent might be a better name. 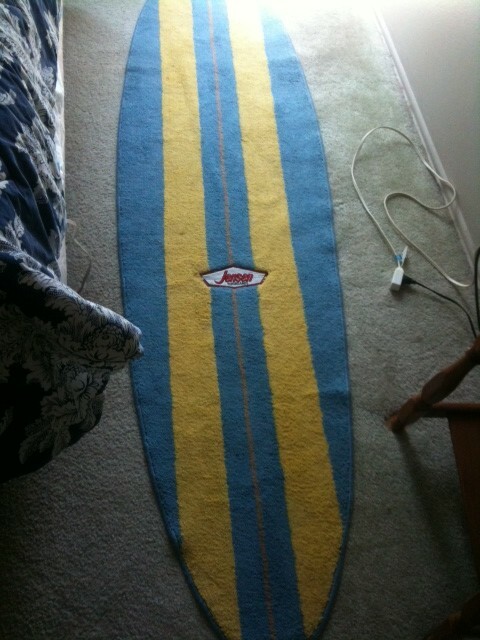 I bought this way before I was committed to surfing and even then it was a piece of junk. Dents all over it, nose previously broken and repaired, and already turning post-white yellow (the picture doesn’t do the yellow-ing justice). It stands 6’5 tall and could probably still shred. I’m gonna have to take it out one of these days and see if it still floats. Where would we be without surfing memorabilia everywhere. 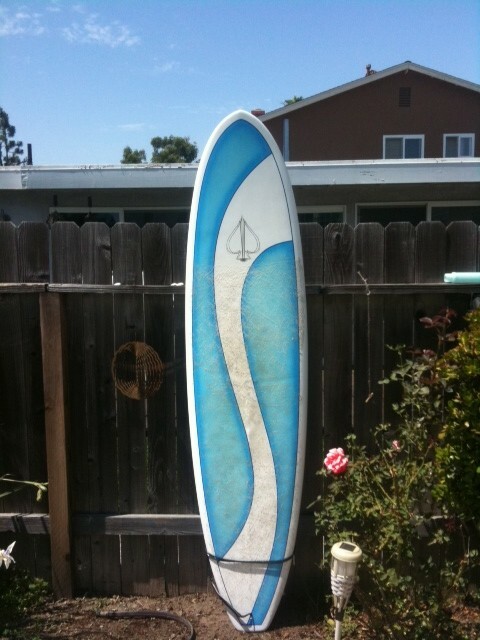 Here is one piece from my house…maybe I can practice my pop ups on it..
Surfboards are pretty fragile. I’m always denting, scratching, and cracking mine. After all they they are just shined up pieces of fiberglass. This is where the padded surfboard bag comes in. 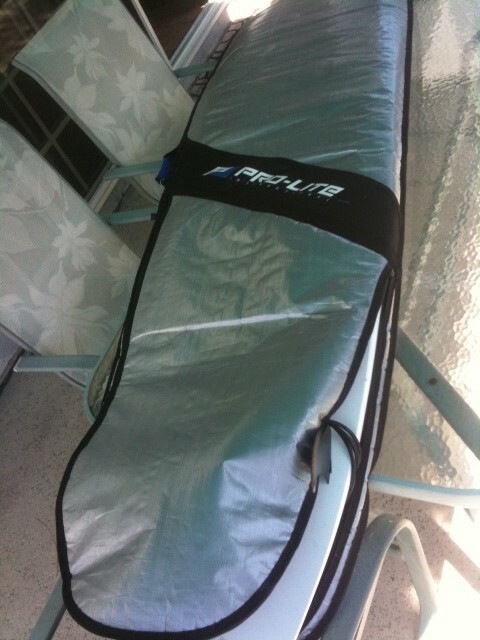 Great for garage storage and for the surf trip (will I ever take one of those?). From the movie Airborne, where Mitchell is a kid from California who moves to the midwest and has dreams about the ocean, specifically about Pepe the Spanish-speaking shark. Here he is introducing himself to the class.